Mausoleum of Centcelles, at Constanti, Tarragona. In spite of the many researchs made on this archaeological whole of a Roman villa, conclusions are never clear. Many phases of Roman occupation have been documented on it, from 1st to 4th. century. This building belongs to the latter one, called "Paleochristian". Complete building of the villa is ca. 90 m. long. It is basically composed by two big rooms. At both ends there are termae. Only one is finished-. The first from both chambers has a rectangular lobed plan -with big semicircular cuts at both sides-. It was the main chamber at the villa. It was covered by a dome not preserved today. 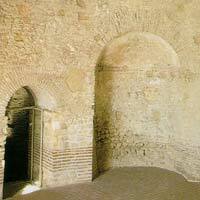 From this one there was an access to a second chamber with a circular plan, today it is the mausoleum. It has four semicircular niches and keeps its original dome, an isolated case on the Peninsula. This is the chamber that gave prestige to the whole. On the walls, before the cornice, there are two windows with a conical section to make illumination better. 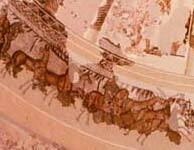 Indeed, it has outstanding wall paintings and polichrome mosaics well preserved. There are hunting scenes, the years' seasons... but the most outstanding deal with Bible writings -Daniel and the Lions, the Good Shepherd, Noe's Arch resurrection of Lazar-. These are the eldest Christian representations on Roman buildings never known. After the building construction it was adapted to be a mausoleum: a crypt was built for its sarcophagus and a subcrypt for isolating it from underground humidity, as it was made at Roman tradition of mausolea-temples. Facture of mausoleum -walls and dome- is made of brick. It has been later modified at some parts with little ashlars. Exterior part, at the main façade, showed a portico that completed all the rooms. 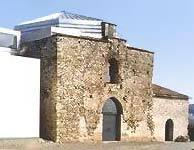 Possibility that mausoleum were the tomb of Constanc -Constantius-, son of Emperor Constantinus the Great -died at 350- or even of Constantinus himself, has been considered, but it is sure that beginning of constructing is prior to it. Anyway the person to whom the mausoleum was devoted belonged to a high level political, social or religious class. 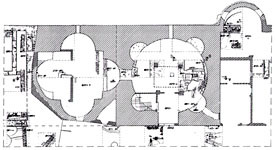 Plan of the villa with both main naves: the right one belongs to the Mausoleum.